Every year at HighWire we like to bring our community together to share and discuss the latest developments in the world of scholarly publishing. You can now register to attend our London event on Thursday June 13th by completing the registration form on this page. 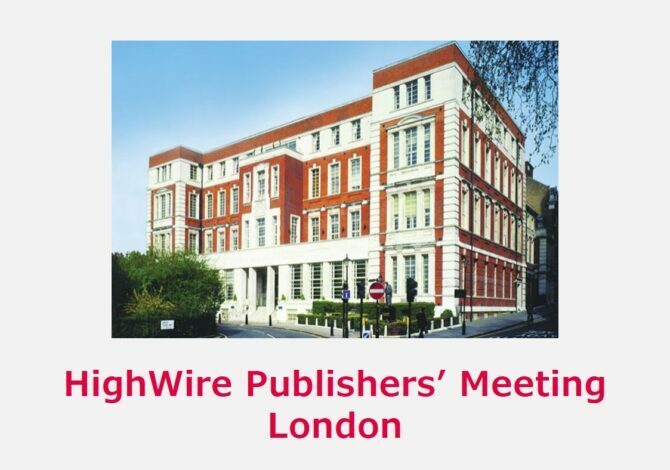 This two day event will provide you with the opportunity to hear from fellow publishers about their latest developments, learn more about HighWire’s latest product developments and partner services, and collectively tackle some of the big challenges through interactive workshops. Transformative Agreements: Can they be aggregated and group-negotiated? The price to attend the Publishers’ Meeting is $299 (£225). If more than two people attend from the same organisation, the third person is free-of-charge. If you’d like to attend the Publishers’ Meeting, but can’t make this date, we are also hosting a Publishers’ Meeting in Washington on May 8th – 9th. If you would like your badge to reflect a different name, for example - "Joe" instead of Joseph. Please indicate the name that you will like to see printed on your badge. Is this your first HighWire Publishers' Meeting? Will you stay for dinner after the Main Meeting Sessions? Will you join us for drinks after the conclusion of our meeting?